France's President Francois Hollande and his Egyptian counterpart Abdel Fattah Sisi have agreed on Egypt's acquisition of two Mistral-class ships, the French leader's administration said Wednesday. "President of the Republic spoke with President Sisi. They agreed on the principle and terms of the purchase of two Mistral-class projection and command ships by Egypt," the statement reads. 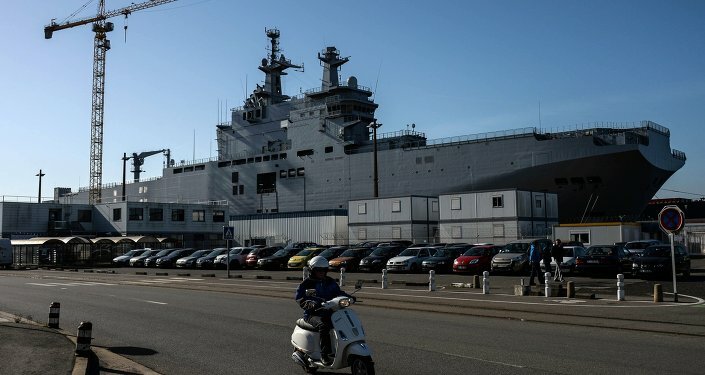 France will not take a loss on the sale of two Mistral-class helicopter carriers, government spokesman Stephane Le Foll said Wednesday. "[There was] no financial loss in the sale of the two Mistral ships to Egypt," Le Foll said quoted by Le Figaro. A source within Russia’s military and technological cooperation told RIA Novosti that Moscow is unlikely to interfere in the Paris-Cairo deal. "Egypt is a friendly state for Russia, so if Paris and Cairo did reach an agreement on the acquisition of these ships, Moscow is unlikely to voice any opposition to this agreement," a Russian source in the sphere of military-technical cooperation confirmed RIA Novosti Wednesday. Earlier it was reported, that a delegation of high-ranking Egyptian officials is currently in Paris to negotiate the purchase of two Mistral-class helicopter carriers originally built for Russia. According to France’s La Tribune daily, the Egyptian military is also considering the purchase of two Gowind-class corvettes from France under a 2014 contract, the newspaper cited a confidential source as saying. La Tribune indicated, however, that Cairo was unhappy with the high price tag on the two helicopter carriers. Russia’s contract for their construction and delivery stood at 1.2 billion euro (over $1.3 billion). This summer the Egyptian military has received the first three French-made Rafale fighter jets during an official ceremony at a flight test center in Istres, in southern France. The delivery came five months after Cairo signed a $5.6-billion package of purchase deals to buy 24 Rafales, as well as a Fremm multipurpose frigate, and short- and medium-range missiles. Paris and Cairo also signed a contract estimated at ‎€1bln ($1.1 billion) to supply four Gowind-class corvettes to Egypt. The implementation of the Mistral deal, reached in 2011, was initially suspended by France in 2014 over Russia's alleged participation in the Ukraine conflict. The Mistral deal was officially terminated in August. France repaid Russia around 900 million euro ($1 billion at the current exchange rates) in compensation for terminating the contract.